January is gearing up to be one of the largest release months in the history of American Z Line, and possibly in Z scale to date. At this time, we are looking at quite a few new and exciting mid-month releases. But more about that in a few weeks. For now, we have a great line up to start the month off! We are starting off 2013 as we left off 2012… and that is with Santa Fe! We also have the long awaited undecorated GP38-2s in stock. Early indication is that these are in high demand! In keeping with the ATSF theme, AZL is now offering ATSF 60’ beer reefers and 2420 waffle gondolas. Finally, we are offering a single TTX 89’ flat car. This is the last car in the initial release. Dealer standing orders are shipping immediately. NOTE: Ztrack Corporate offices are close from December 29th through January 4th 2013. All orders that come in during this time will be shipped once our offices open. 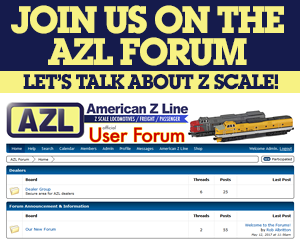 Also make sure to visit the AZL forum!